From flitting sporadically and erratically around the edges of the music scene, it’s possibly to form occasional observational and lightly-informed opinions. I have hundreds. Many of them so self-evident they barely bear recounting. One that seems worthy of at least a little light attention is the casual observation that gypsy music has been on the rise in recent years. There’s more on the radio, there’s more on festival programs and gig guides are swelling with their ranks. Struggling to differentiate between Roma Music and Roma Street Station, I spoke to a number of exponents of the art-form. My interest was piqued about a year ago when UK-bsed Paprika Reloaded (previously Paprika Balkanicus) came to Australia and whipped up a frenzy of punter acclaim wherever they went. I Canberra, just these five guys on stage, dressed conservatively in white shirts and black pants – no elaborate lighting or special effects – created pandemonium. There was dancing in the seats, dancing in the aisles, and every security’s detail’s nightmare, the crowd was invited up for dancing on the stage. Bass player Josef Secnik commented on the rise of interest in gypsy music and world music generally. Josef: ‘I would say [there is a big scene in Europe], and not just Balkan music; I think world music is getting more recognition and more prominent than it did which is really great, because every area of this planet definitely has some great culture to offer. That’s what we like. Ben Charnley from Melbourne band the WooHoo Revue reiterates this for the Australian scene. ‘The gypsy music scene in Australia has really started to blossom. When I started playing with the Counterfeit Gyspsies, there was only a handful of bands getting around doing it, like Doch and a few others. T&N: How does that go with so many bands? Does it then present a lot of competition with so many people going for gigs? Or does one create a drive and demand for more? T&N:And what of labels for your music? It was this distinction (or one of many) that I was slowly learning: the distinction between gypsy and gypsy-influenced, as pointed out early on when I spoke to Karen Kyriakou of Melbourne’s Kazband. ‘We’re not really a gypsy band – we’re a fake gypsy band! It’s mostly original stuff and it’s gypsy-influenced, so we’re not really competing on that same level. It’s good, people like it and people like to hear what they know, so hearing different stuff and what that they is good for everybody. ‘It was a comment from Jason Day (clarinet player) four years ago now: “You should play music that you like to play.” So I did! We have one gypsy standard on the album (Cockroach and Other Stories…) to please the people who keep calling us a gypsy band! I spoke to Nadya Golski of Sydney-based group 101 Candles Orkestra on cultural and influence aspects of gypsy music. ‘We’ve all been brought up with Eastern European and gypsy music – it’s very much part of the culture. They gypsies have been living in Eastern Europe for so long, so the music has managed to enmesh itself into the musical identity of the countries of Eastern Europe, like Poland and the Balkans. And Russia, Romania and Hungary as well. As Nadya and the Orkestra are very much the international touring act, I asked her about the responses and interest from different places she tours to. ‘It’s very popular in France. People absolutely love it. We’ve also performed in Hungary at the Sziget Festival, a world music festival – and Goran Bregović was also playing at the same time – and we’ve also performed in the Edinburgh Fringe Festival, at the famous Speigeltent. 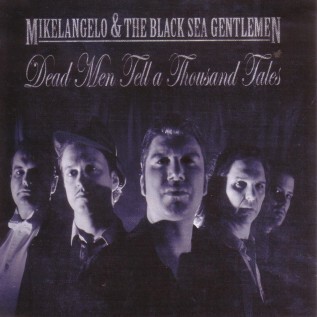 Finally, in a wide-ranging interview that covered matters as diverse as the availability of donkeys as transport in the Nation’s capital to the sporting of early 20th Century bathing costumes as stage apparel, I spoke with Mikelangelo and the Great Moldavio of the Black Sea Gentlemen. Mikelangelo: ‘I think it’s interesting with labelling and I do understand why it has to be done. In some ways it’s market-driven, in some ways it’s driven by the fact we’re all time-starved and you can’t always spend 20 minutes explaining what you’re doing. Mikelangelo: ‘I have some very good gypsy records in my collection. I listen to them sometimes, but they’re not an overwhelming influence on my song-writing. ‘I think what’s interesting about gypsy music and European folk music and classical music is that they all borrow from each other. And so ‘gypsy’ has become a label to be used. In some ways it’s nice for the gypsy to be celebrated; the gypsies were, and in some ways still are, the subjugated sub-class of humans so there’s almost a reaction to celebrate these people. ‘In some ways that’s good, but that’s not what we’re about. What we’re about is story-telling and in some ways I think we cut back into that point where gypsy music and European folk music and classical music all do meet and do borrow from each other. ‘Gypsy musicians would and to some degree still do in some ways make their living from just knowing some songs and music from EVERY culture. Where they may specific parts of their culture which are songs from a particular area; they’d know klezmer songs, they’d now popular songs of the day, or they’d know some classical tunes they could play – and might have their own stylings. Gypsy, faux-gypsy, gypsy-influenced: whatever tag you want to apply, there’s certainly a lot of it about – much more than can be crammed into one article – and well worth checking out at the next festival or in your gig guide.